This photo was sent to me by Marijn Roosen, a Dutch student doing field work in Ecuador for an agricultural institute. The exact locality is not known to me, but nevertheless this picture shows a characteristic species: Zoniferella vespera (Jousseaume, 1887). This entry was posted in Uncategorized and tagged achatinidae, ecuador on February 7, 2019 by bramb. Just published: a paper on the life history of some subulinid species by D’ávila et al. The abstract reads: “In the present study, we aimed to characterize the life history of the land snail Subulina octona integrating information on life- history traits and morphology. We also compared the histology of the free-oviduct and spermoviduct of ovoviviparous and egg-retaining species of subulinids. We considered as ovoviviparous the species in which the complete embryonic development as well as egg hatching occurs inside the parent’s body and, at the end of this process, the parent releases juveniles instead of eggs. We considered as egg-retaining the species in which a great part of the embryonic development takes place inside the parent’s body and the eggs laid contain well-developed embryos. The results showed that the free-oviduct of both ovoviviparous and egg-retaining species shows a histological arrangement that confers greater strength to its walls and is probably related to egg retention. The wall of the spermoviduct is formed by pseudostratified columnar epithelium, with cell apical processes (probably cilia), and by underlying secretory cells. In gravid egg-retaining snails, the eggshells appear in close contact with the secretory cells of the spermoviduct. This fact suggests that these cells play a role in eggshell formation. The present study is the first account for histological features of S. octona, Allopeas gracile and Allopeas micra. The life history of S. octona is a combination of long life-span, early sexual maturity, indeterminate growth and egg reten- tion. Egg retention limits the number of young that can be produced in one reproductive event. 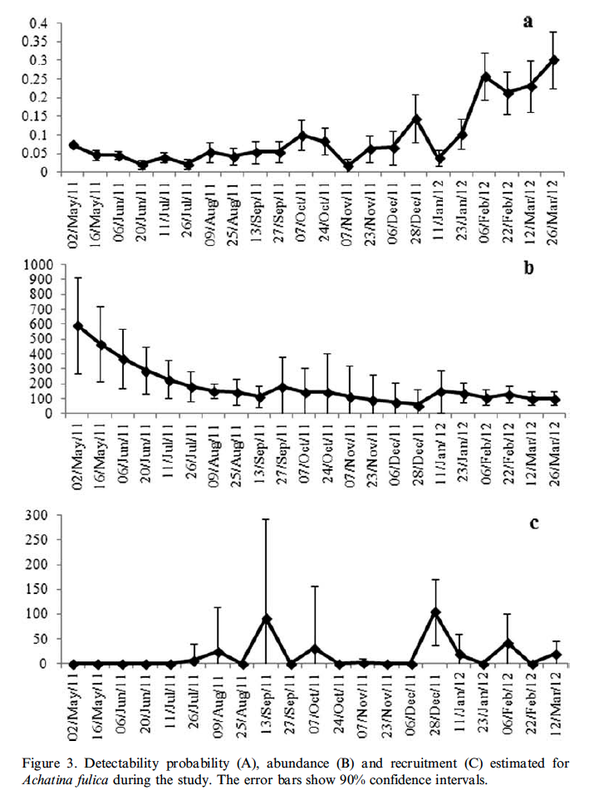 However, the reproductive strategy adopted by S. octona, associating egg retention and K-strategism, compensates this cost of retaining eggs, because the reproductive success may be enhanced as a result of the higher survival of juveniles and the possibility of performing sev- eral reproductive events during the year”. Since there are too many papers on the life history of land snails, this a welcome contribution. Especially since these subulinids are wide-spread, this paper is also of interest to non-Neotropical malacologists. D’ávila, S. et al., 2018. 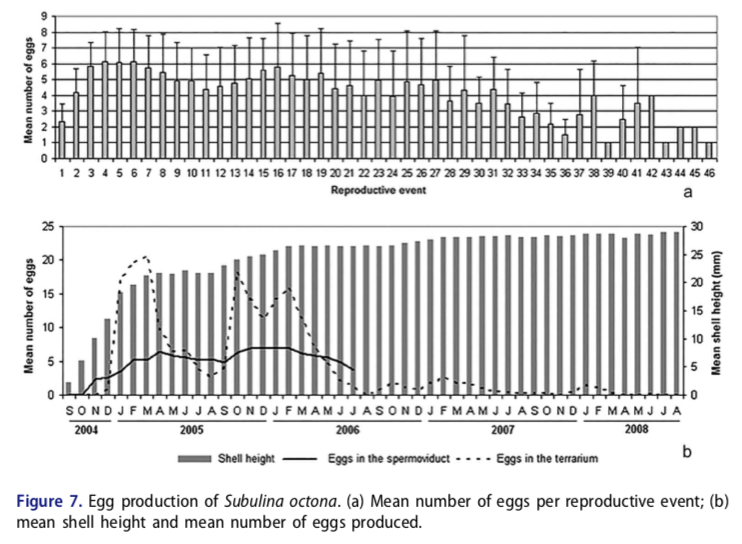 Life history of Subulina octona (Brugüière) (Gastropoda: Pulmonata: Subulinidae) based on four-year laboratory observations and a comparative histological analysis of egg-retaining and ovoviviparous subulinids. – Journal of Natural History 52 (23-24): 1551-1569. This entry was posted in Uncategorized and tagged achatinidae, biology, brazil, literature on June 27, 2018 by bramb. Miranda et al. (2015) published (advanced online) a paper dealing with two Megalobulimus species. Their abstract reads as follows: “Native Megalobulimus paranaguensis was identified on Brazil’s Ilha Porchat promontory, an area that Achatina fulica commonly populates. The population structures of these species were investigated for interactions. Spatial distribution, niche overlap and mark–recapture analysis were conducted. The outer lip of M. paranaguensis and environmental variables were measured. As can be seen from the above figures, the observations were made during one year resp. 7 months. The conclusions thus have to be viewed within the context of this limited evidence. Miranda, M.S., Fontenelle, J.H. & Pecora, I.L. (2014 ). Population structure of a native and an alien species of snail in an urban area of the Atlantic Rainforest. – Journal of Natural History, 49: 19-35. This entry was posted in Uncategorized and tagged Achatina fulica, achatinidae, brazil, literature, megalobulimus, Megalobulimus paranaguensis on November 30, 2014 by bramb. The Giant African Snail (Lissachatina fulica) is around in Brazil for more than 30 years. Aquino (2013) has made his Master thesis on this subject within the framework of biology and health policy. Since this kind of theses is often difficult to grasp (no formal publication, unless the author takes the effort to write also a paper summarising the data), it is mentioned here. As an exception, the full text (in Portuguese) is added after the reference. The abstract reads: “Since it had been introduced in Brazil dating back to the 80s, the Great African Snail Achatina fulica has spread all over the country. Some researchers associate its incredibly good adaptation success to the dermal mucous of this species. With the objective and the aim of better knowing and understanding the dermal mucous of the Great African Snail and also suggesting new forms of taking advantage of it with a view to controlling this invading and exotic snail, this study work carried out the chemical characterization of the shell, of the snail without the shell and of the dermal mucous of the Great African Snail in the State of Alagoas, Brazil, and also evaluated and assessed the scarring/healing action of a solution from the mucous, already confirmed for skin tissue, in corneal ulcers surgically produced in rabbits. The wild snails were kept in a laboratory utilizing a new methodology specially developed for keeping arboreal snails in laboratory, with sensibly improved hygienic conditions, reduction of the time spent for the daily treatment and reduction of animal stress. This methodology has been described in details at the XXII EBRAM in 2011, in Fortaleza, State of Ceará, Brazil, and published in the form of a scientific article under the name “new breeding management for snails (molusca: gastropoda: pulmonata) in plastic boxes (recipients/containers)”. The following analyses were carried out: the mineral composition of the snail without its shell, of the shell and of the mucous; the centesimal composition of the lyophilized mucous and the anti oxidizing capacity evaluated through the seizing activity of the free radical 2,2-diphenyl- 1-picryl-hydrazyl (DPPH). With regards to the results, the macro and micro minerals composition present in the snail without a shell, in the shell and in the dermal mucous of the A. fulica was determined for 23 nutrients, 5 macro-nutrients (Ca, P, Na, K and Mg) and 18 micro-nutrients (Al, As, Ba, Cd, Cr, Cu, Fe, Li, Mn, Mo, Ni, Si, Sr, V, Zn, Co, Sb and Se). With regards to the centesimal composition, the following data was obtained: dried matter (91.72 ± 1.85), humidity (8.28 ± 0.97), ashes (31.1 ± 0.35), crude protein (49.97 ± 3.21), carbohydrates (8.15 ± 1.43), total calories (242.48 ± 53.23), lipids in 100 g (2.5 ± 0.44), cholesterol (50.2 ± 0.3). The mucous did not show anti oxidizing capacity in any of the analysed samples. 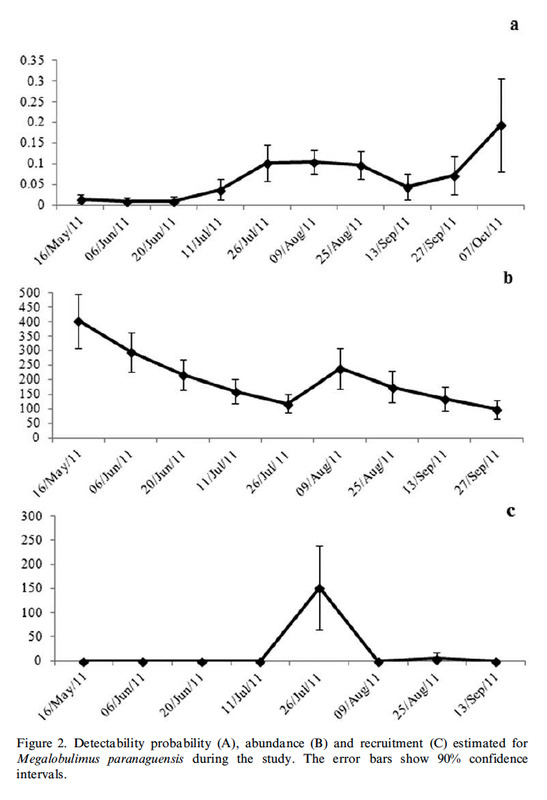 For the experiment in vivo, the evolution of the corneal lesions on the 18 rabbits, divided in three groups of 6 animals: the control group, the mucous group and the group treated with the ophthalmic solution Epitegel, was accompanied and monitored by the percentage measurement of scarring/healing of the 36 areas of scarring through 144 macro photographs taken along the experiment at 0, 24, 48 and 72 hours. To carry out the experiment, duly approved by the Ethical Committee of UFAL (The Federal University of Alagoas), process no. 010190/2011-85, a scalpel blade to remove the corneal epithelium previously circumscribed by a circular scalpel (punch no. 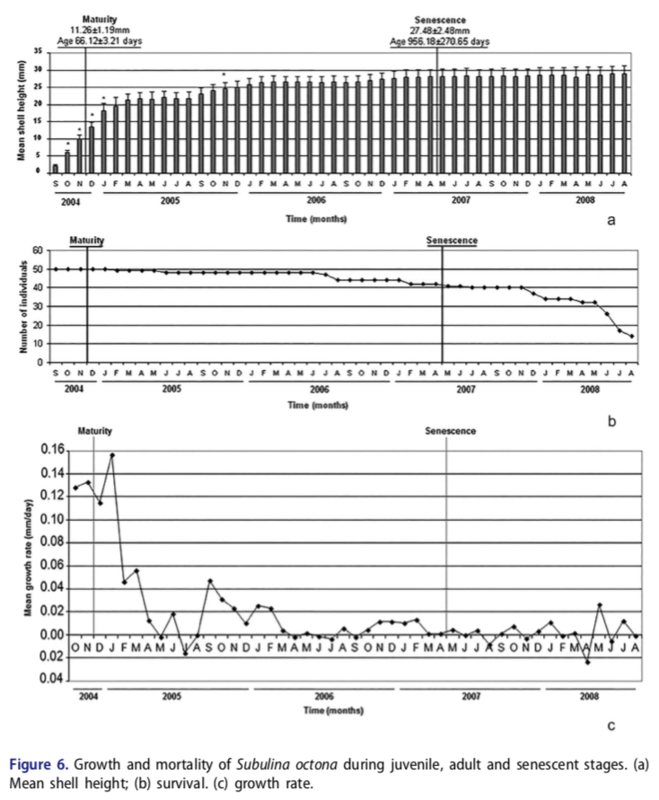 5) and the anaesthetic protocol utilized comprised 3 steps: tranquilizing with acepromazine (0,05 mg / kgPV/IM), anaesthetizing with cetamine chlorydrate (12mg/IM/kgPV) and local anesthetizing with proxymethacaine chlorydrate 0,5%. For the orientation regarding the ideal choice for mucous concentration for the treatment of the lesions on the experiment in vivo, solutions were tested in the following concentrations: 0.01 mg mL-1, 0.03 mg mL-1, 0.06 mg mL-1 and 0.125 mg mL-1. The cellular viability was verified through the MTT and Tripan Blue methods. No statistical differences were observed between the tested concentrations; therefore, the chosen concentration to be the base for the preparation of the ophthalmic solution was the one that gratifyingly better stimulated the cellular proliferation (0,125 mg mL-1). With regards to the results, there were no statistical differences between the mucous group and the Epitegel; the ophthalmic solution based on the mucous (0,125 mg 25 μL) had a similar performance to the ophthalmic solution Epitegel 10g (Ophthalmological Gel Dexpantenol 50 mg g-1, positive control), one of the best available medicines in the market for the treatment of corneal ulcers/lesions. Nevertheless, both presented some significance regarding the result of the control group, which presented a longer scarring/healing time. With 72 hours, of the 12 lesions of the control group, only 2 (16,66%) were scarred/healed; of the Epitegel group, only 8 (66,66%) were scarred/healed and of the mucous groups, all (100%) were scarred/healed. It has been thus demonstrated the scarring/healing capacity of the A. fulica’s mucous also for the treatment of corneal ulcers and its specific action, furthermore than merely accelerating the recovery of lesions in animals and it also did not produce, in any of them, a single visible scar. It is yet to be exactly known its action mechanism in conjunction with the set of steps of the corneal scarring/healing, especially if it detains a stimulating action over the reproduction of trunk cells, which are responsible for the regeneration of this epithelium”. Aquino, M. C. (2013): Caracterizaçao química do caracol africano (Achatina (Lissachatina) fulica (Bowdich, 1822) e avaliação dos efeitos do muco cutâneo em úlceras de córnea em coelhos (Oryctolagus cuniculus). MSc. thesis, Instituto de Ciências Biológicas e da Saúde, Universidade Federal de Alagoas, 94 pp. 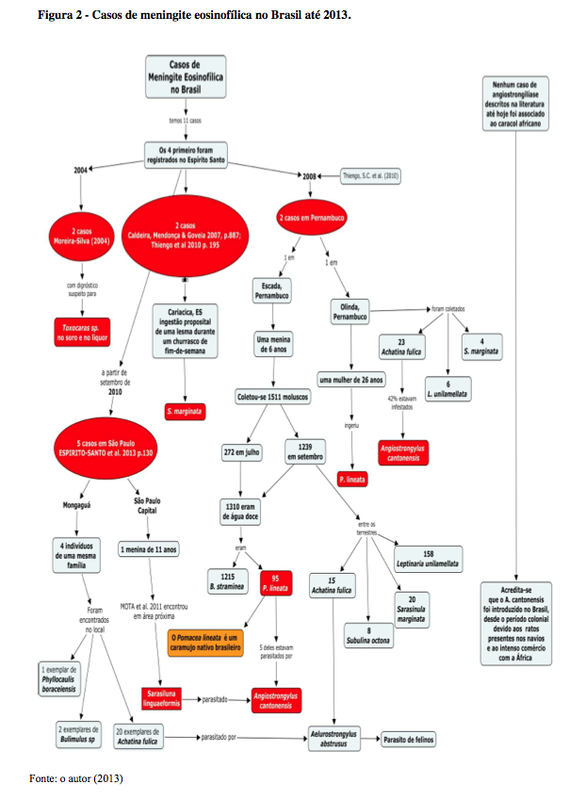 This entry was posted in Uncategorized and tagged achatinidae, brazil, infection, literature on May 8, 2014 by bramb. The best way to reduce problems related to invasive species is by preventing introductions into potentially susceptible areas. 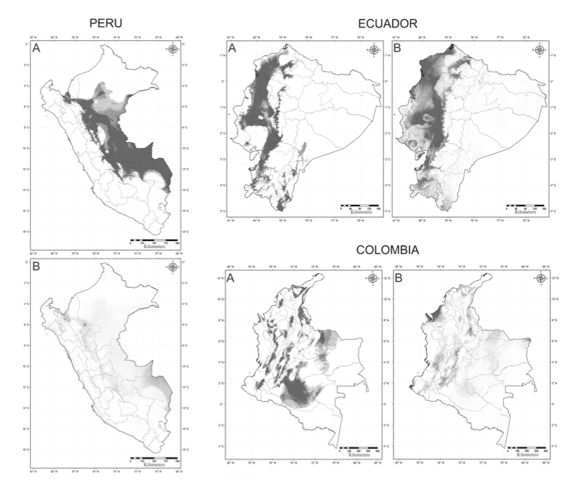 The purpose of this study was to create distribution models for the invasive gastropod Achatina fulica Bowdich, 1822 in South America in order to evaluate its potential geographic distribution and identify areas at potential risk. This mollusc, considered one of the 100 world’s worst invasive alien species, is the focus of intense concern due to its impact on agriculture, human health, and native fauna. We tested two commonly used ecological niche modeling methods: Genetic Algorithm for Rule-Set Prediction (GARP) and Maximum Entropy (MaxEnt). Models were run with occurrence points obtained from several sources, including the scientific literature, international databases, governmental reports and newspapers, WorldClim bioclimatic variables, and altitude. Models were evaluated with the threshold-independent Receiver Operating Characteristic (ROC) and Area Under the Curve (AUC). Both models had consistent performances with similar areas predicted as susceptible, including areas already affected and new potentially susceptible areas in both tropical and temperate regions of South America. This new study is more detailed and much more elaborated than Borrero et al. 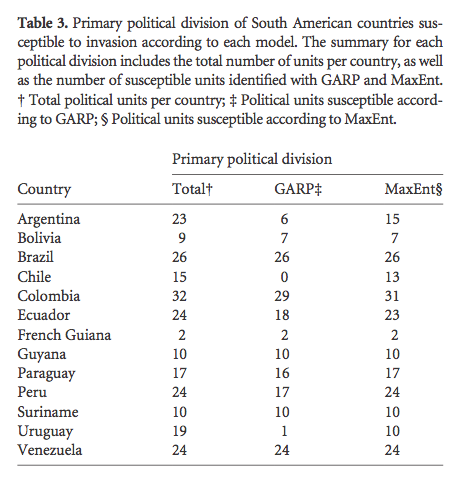 (2009), and uses two modeling methods, (A) GARP and (B) Maxent, of which the latter is generally performing best in comparative studies. The relevance of presenting country maps for potential distribution of this species in each South American country is clear: the responsible authorities now have a handle to focus their attention to areas most under threat. Generally, the Amazon basin is most infected or theathened, but certain areas in Ecuador, Colombia and Venezuela are across the Andes but have already been invaded. The following table shows that none of the South American countries can escape to the threat of GAS, although there are gradual differences. Borrero F.J. et al., 2009. Into the Andes. Three new introductions of Lissachatina fulica (Gastropoda, Achatinidae) and its potential distribution in South America. – Tentacle 17: 6-8. Vogler, R.E., Beltramino, A.A., Sede, M.M., Gutiérrez Gregoric, D.E., Nuñez, V. & Rumi, A., 2013. The Giant African Snail, Achatina fulica (Gastropoda: Achatinidae): using bioclimatic models to identify South American areas suspectible to invasion. – American Malacological Bulletin 31: 39-50. This entry was posted in Uncategorized and tagged achatinidae, argentina, bolivia, brazil, chile, colombia, ecuador, frenchguyane, paraguay, peru, uruguay, venezuela on February 22, 2013 by bramb.